General Hospital Spoilers: Peter and Kim’s Shocking Connection Revealed – Are They Brother and Sister? 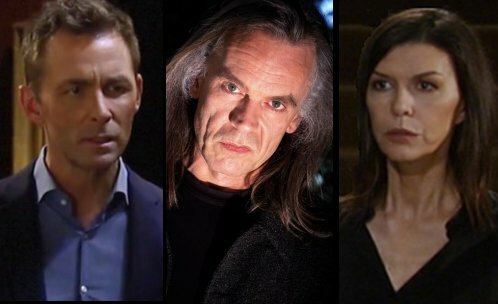 General Hospital (GH) spoilers tease that there may be a family connection between two recent Port Charles residents. We recently learned from Anna Devane (Finola Hughes) in a recent General Hospital episode, that many years ago, early in her career as a secret agent she went undercover as a prostitute in order to obtain secret information from Cesar Faison (Anders Hove). Out of that early mission so long ago Anna revealed first to the body of the evil Faison that a baby came out of that mission, the result of a one-night stand in which Faison had been drunk, and now has also confided the secret to her good friend and memory–mapping inventor Andre Maddox (Anthony Montgomery). Anna was quite shocked to learn that upon questioning her old WSB spy school classmate Valentin Cassadine (James Patrick Stuart) about any past dealings he may have had with Faison, that he knew all about the baby she had given birth to and given up for adoption! Valentin, no doubt still enamoured with her at the time, followed her to Brussels and after the birth, questioned the midwife she used who (supposedly) told him Anna had given birth to not a boy, as she supposed, already suspecting Peter August (Wes Ramsey) of being Heinrich Faison, but rather, another girl, who would be older than Robin. What if Anna gave birth to not just a baby girl, but twins…. possibly fraternal twins, a girl and a boy? Anna herself is a twin. Octavian became Augustus, a Roman emperor. Nero was a Roman emperor. Dr Kim Nero (Tamara Braun) came to Port Charles around the same time Peter August did. Does it not stand to reason that the two might be connected? Could Dr. Kim Nero and Peter August be Anna’s twins with Faison? Stay tuned to the ABC soap and don’t forget to check CDL often for the latest General Hospital spoilers, updates and news.